Plantations were a way of life in the South before the Civil War. While tobacco was profitable and cotton was king, in Louisiana they grew sugar. A strip in south Louisiana along the Mississippi River, from New Orleans north to Baton Rouge, had the highest concentration of millionaires in America. These owners used the Mississippi River to export their product abroad. I recently stopped by Nottoway, one of the grand old southern estates, a former sugarcane plantation called the White Castle. The location later became known as White Castle, Louisiana. It’s the largest surviving antebellum home in the South with stately live oaks dripping Spanish moss and boxwood gardens. It immediately brought the song “Summertime” to mind. The destination offers visitors a glance into the affluent lifestyle during pre-Civil War times, and should they desire (and pay for overnight lodging) they may experience that themselves. John Hampden Randolph was one of the wealthiest planters from Louisiana. He married Emily Jane Liddell in 1837 and went on to have eleven children. Randolph moved his family to southern Louisiana in 1842 after purchasing a 1,650-acre cotton plantation He soon converted the land to sugar production and constructed a steam-powered sugar mill that tripled his earnings. Within ten years, he had increased his holdings to 7,116 acres. Randolph owned 176 slaves making him one of the largest slaveholders in the South. In 1855, he purchased an additional 1,000 acres for building an impressive estate. 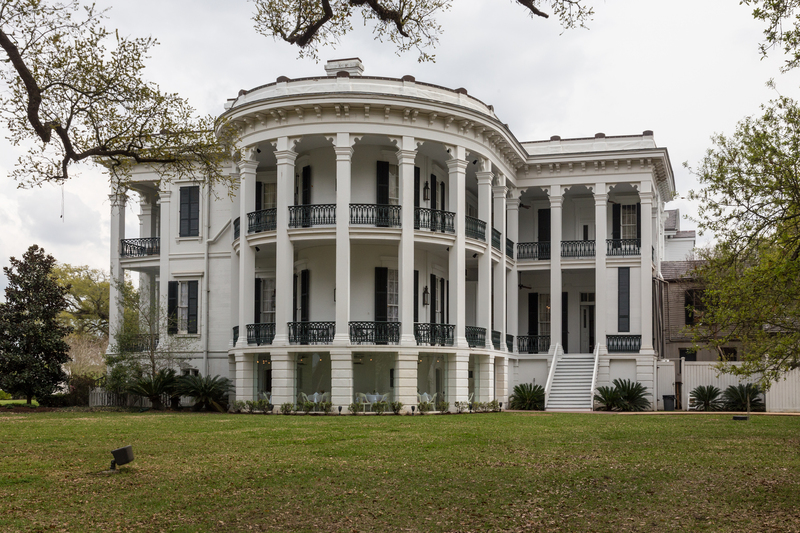 The Nottoway Plantation Greek Revival/ Italianate Style mansion was completed in 1859 at an estimated cost of $80,000. Slaves baked handmade bricks in kilns used to construct the massive structure. Over 40 carpenters, brick masons, and plumbers labored on the project while living in tents. The finished development included a variety of other buildings such as slave quarters, a schoolhouse, greenhouse and stables. Soon after completion, the Civil War erupted. Randolph did not support secession, but once the war began, he backed it financially. He sent his three sons to fight for the Confederacy, losing his oldest son at the Battle of Vicksburg. As the war continued, Randolph took 200 slaves to Texas to grow cotton. He left his wife and the youngest children at Nottoway with hopes that their presence would save it from destruction. The plan worked — both Union and Confederate troops occupied the farming grounds, but Nottoway survived the War with only a single grapeshot to the far left column. That shot finally fell out in 1971. After the war and emancipation, John Randolph contracted 53 of his former slaves to continue as paid workers. When he returned to Nottoway, most came along with him. However, producing sugar had become less profitable and by 1875, the plantation was reduced to 800 acres. John Randolph died at Nottoway on September 8, 1883 leaving the property to his wife. Today the 35-acres of Nottoway are opening for touring, dining and overnight lodging. Most visitors are stunned when they first glance at the Big House; it’s massive. The house has 64-rooms and six interior stairways within a 53,000 square-foot structure. 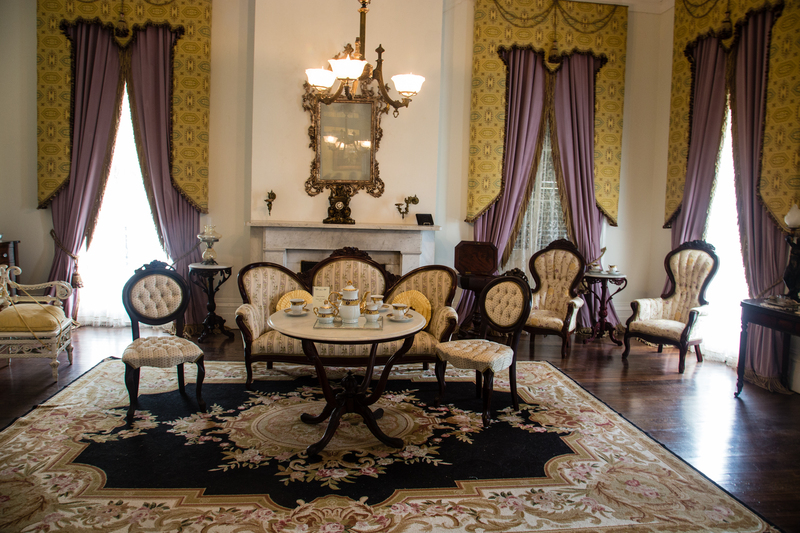 During the antebellum period, Nottoway led the times with indoor carpeting, gas lighting, running water, a bowling alley and an elaborate servant call bell system. The front of the house faces the levee and Mississippi River. Years earlier, a horse and carriage path approached the house. Today, visitors enter on the second-floor after climbing the twin spiral staircase. I found it easy to envision a greeting party waving to arriving guests from this entrance balcony or the one on the third floor. When the front door opened for my group, a guide in a white hoop-skirted dress stepped out to meet us and begin the tour. She explained that the central hall runs the length of the house, some 40 feet long and 12 feet wide. Large crystal and brass chandeliers hang from the 15.5-foot-high ceilings, and family portraits grace the walls. To the right of the entrance hall rests the impressive White Ballroom, reportedly John Randolph’s favorite room in the house. 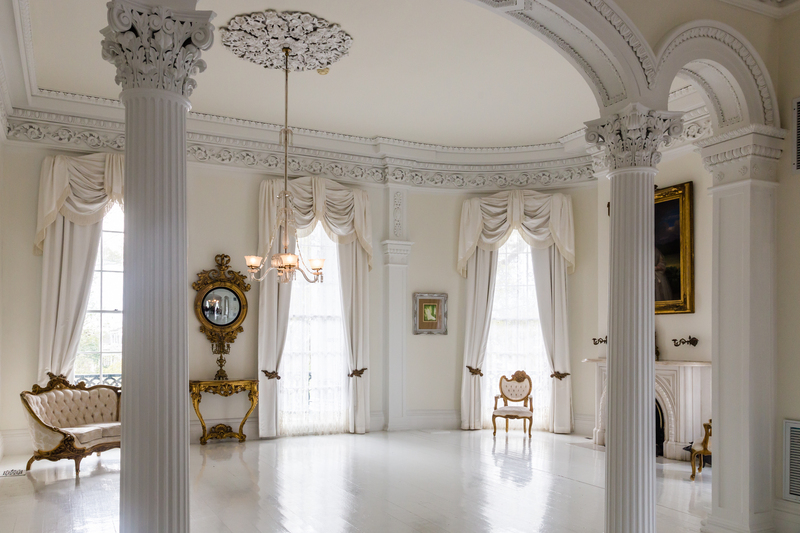 Randolph had it painted entirely white, including the flooring, to show off the natural beauty of his seven daughters, six of whom married there. The room is beyond stunning, with white floor-to-ceiling silk drapes, white upholstered furniture and two fireplaces with hand-carved rococo white marble mantles. Certainly one of the most memorable rooms I’ve ever walked around. The visit continued into the lavish dining room and upstairs to the family quarters. 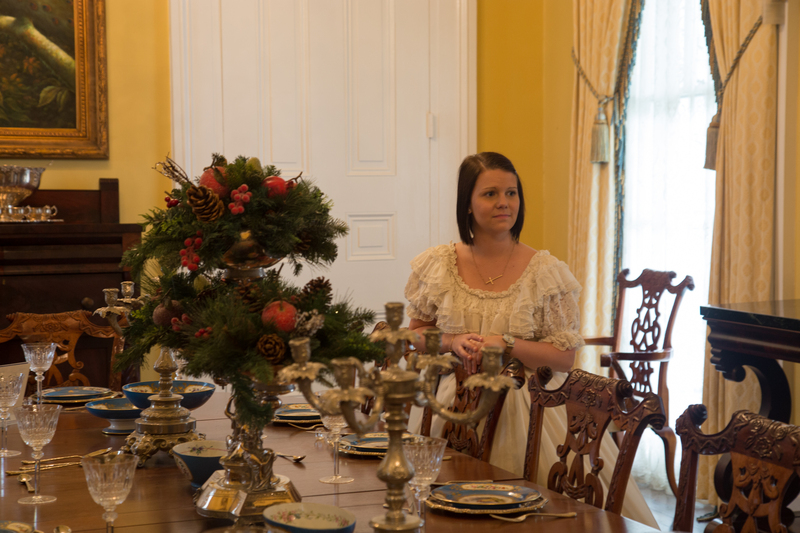 No doubt Mr. Randolph was out to impress; you see and feel the immense wealth of this family and their home through the original and antique furnishings, musical instruments, art and decorations. Visitors find the first-floor basement transformed into a restaurant and a small museum. Historically the space held the laundry, dairy, wine cellar and servants quarters, as well as a 10-pin bowling alley. 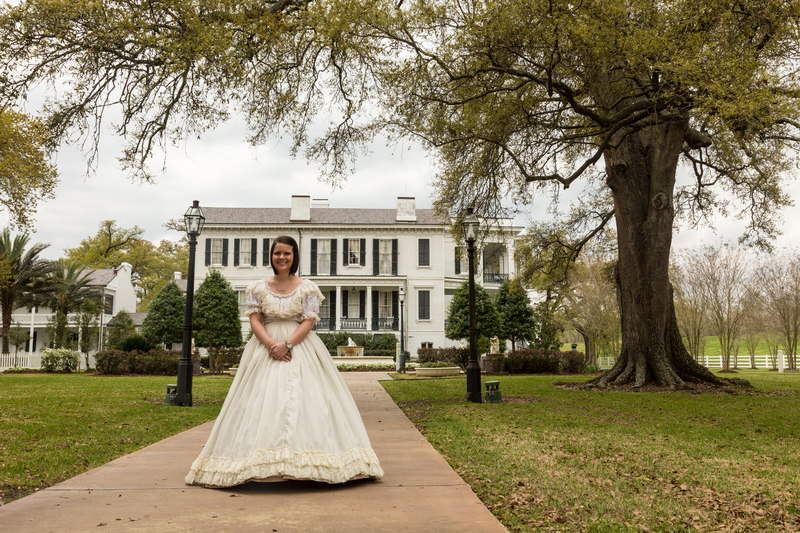 While I enjoyed peeking at the high-society life of Antebellum days, I do feel Nottoway needs to speak to the life of the slaves who kept the plantation running. Perhaps they will add this element to their tour in the future. For an authentic taste of plantation life, guests can stay overnight at Nottoway. The house serves as an inn and is a member of Historic Hotels of America, the official program of the National Trust for Historic Preservation. Choose between the renovated historic Mansion rooms and the deluxe hotel rooms of the Cottages and Carriage House. 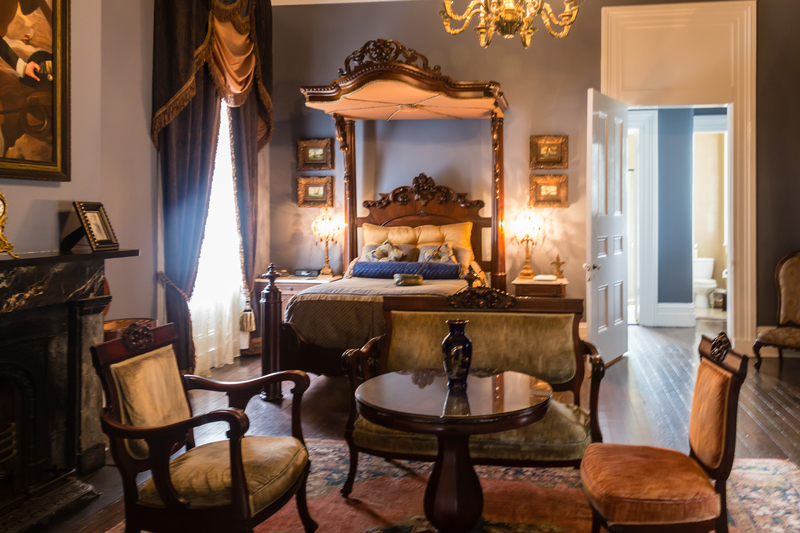 Nottoway’s historic rooms allow you to sleep as the Randolph family did, in spotless chambers of the big house with antique beds and authentic furniture and accessories. Private baths feature modern basins and fixtures, chosen to blend in with the original designs. I would truly love to experience a night in the mansion and stroll the grounds in the evening and early morning. Must be quite a step back in time! Although the Cottages and Carriage House resemble typical plantation buildings, they are modern luxury hotel rooms with plush beds, deluxe private baths, wireless Internet access and flat-screen TVs. Each cottage has two individual units with a single covered porch and oversize rocking chairs; the Carriage House rooms overlook the plantation grounds or sugarcane fields. Resort amenities include casual and fine dining restaurants, an outdoor pool, tennis courts and an on-site salon and spa. Many brides choose to marry and hold receptions at the resort. Disclosure: Many thanks to Travel South for my visit to Nottoway.